Integrating Human Rights into WTO! As a successor of the General Agreement on Tariffs and Trade (GATT), the WTO- since '95 has not only focused on setting rules for trade liberalization, but also for the implementation of these rules through its Dispute Settlement Body (DSB). However, as members of international society are becoming more and more interrelated, decisions of the WTO impact not only on trade relations among member states, but also various other factors such as human rights. Although there is no special onus- as such- on the WTO to consider human rights when they make decisions even so, the responsibility to protect human rights as members of global society is imposed on various international organizations through human rights mainstreaming movement by the United Nations (UN). In addition, member states of the WTO are also members of various international human rights treaties and have responsibilities to protect human rights as well. Trade liberalization concepts that the WTO focuses are deregulation and removal of barriers to market access which operates under certain principles of trading system such as non-discrimination, reciprocity, binding and transparency. These principles are clearly expressed through various WTO legal agreements. It has been argued that the liberalization of international trade will lead us to a promotion of human rights, and effectiveness of international organizations. However, it is debatable whether the WTO's competency in promoting human rights along with the concept of free trade is compatible with the general idea of human rights, especially since, free trade does not always guarantee fair trade. The non-discrimination principle mentioned in International Covenant on Economic, Social and Cultural Rights (ICESCR) cannot be equated with equal treatment. After the WTO ruled that the European Committee is violating the concept of free trade and made them cut down barriers, a huge number of small producers has already gone out of production. Many studies show that free trade policies adopted by the WTO widen gaps between rich and poor countries, and infringe individuals' Economic, Social and Cultural Rights instead of promoting them. Consequently, rights which are produced by the WTO's trade relationship are instrumental values rather than fundamental human rights that are recognized in international society. Yet, it does not mean that the WTO should not incorporate human rights into its policies and decisions. Most of human rights movements in the early days were focused on civil and political rights, and how to refrain states from violating individuals' human rights. However, in these days, not only states but also non-state actors such as Multi-National Corporations are becoming violators of human rights. Therefore, efforts to regulate those non-state actors are being made through the UN and NGOs. Member states of the WTO have responsibilities to protect the human rights of their citizens as they ratified other international human rights instruments as well. As of July 2007, the WTO had 151 member states and these states also ratified as least one of the basic international human rights instruments. States which ratified those instruments have an obligation to submit regular periodic reports to the Committees formed under those instruments and are monitored by these Committees. Unfortunately, the enforcement system of international human rights law is not as powerful as that of the WTO. Despite that the UN High Commissioner for Human Rights makes it clear in one report that trade law should be interpreted consistently with human rights law as it is an international customary law and it will bring attention to vulnerable individuals. As of December 2007, 128 states ratified ICESCR among 151 WTO member states. Unfortunately, there are some conflicts between protecting ESCR and promoting liberalism. For those states that ratified ICESCR have a responsibility to promote their citizens' ESCR progressively under the principle of non-discrimination and set minimum core standards to protect ESCR. Officially, the WTO does not have any formal agreements with the UN since it was the GATT. However, there has been an exchange of letters on cooperation between the UN Secretary General and the WTO Director General. Mainstreaming human rights programme by the UN is not only limited to its affiliated organizations but to all organizations which are relevant to the works of the UN, even though there are concerns about the possible institutionalization and materialization of human rights which threatens to accompany the incorporation of human rights into the WTO. So, how to integrate human rights into the WTO? It is obvious that claims which are not directly related to trade law cannot be dealt with in the WTO. Therefore, one of the most practical ways to protect human rights from the perils of trade liberalization is to strengthen the international human rights monitoring system. Integration of human rights into the WTO can be achieved by a broader interpretation of the WTO legal agreements. If there are conflicts between human rights and WTO rules, WTO cannot favour human rights but can only interpret WTO rules in a way which is compatible with human rights obligations. Vienna Convention states how to interpret international treaties and advises state parties to interpret it in 'good faith' in accordance with its object and purpose. In past cases the GATT decided to exclude any consideration of the Convention on International Trade in Endangered Species (CITES) on the grounds that not all members of the GATT had ratified this convention. This can be seen as a narrow interpretation of WTO legal agreements. In addition to a broader interpretation of WTO agreements, adaptation of opinions from experts from diverse backgrounds is necessary before decision making. DSB panels should be independent from their own interest, but at the same time, should be proficient in international trade law and liberal trade system. This standard also applies to members of the Appellate Body, though access to dispute settlement system is only limited to WTO members and no one else can participate. It is necessary to incorporate human rights into WTO, but at the same time, it is important to think of how to practice this in reality. Even though the WTO is not human rights focused organization, this change will help WTO to bear a responsibility as a member of the global society. The WTO was established to regulate international trade relationship among its member states based on liberalism. The WTO must take responsibility by considering factors such as human rights in all of its decisions. In reality, it would be difficult to incorporate human rights into trade liberalization because of the undervaluation of ESCR and weaker monitoring system of human rights. However, we should bear in mind that member states of WTO are also members of many international human rights conventions. In result this will undoubtedly lead to a bright future for global society in which all members including members of the WTO can cooperate harmoniously to improve current human rights situation. The writer is an Advocate- Legal Researcher; recently completed his second LL.M. in International Development Law and Human Rights from the University of Warwick, UK as a Chevening Scholar. The Taiwanese parliament passed a resolution on 11 November calling on the Government of Japan to accept historical responsibility and apologise to the victims of Japan's military sexual slavery system. This follows a resolution passed in South Korea on 27 October. In 2007, the US, EU, Netherlands, and Canada all passed resolutions calling on the Government of Japan to restore the dignity of those women who were drafted into military sexual slavery before and during World War II. The Taiwan and South Korea resolutions are significant as many of the “comfort women” came from these countries. In Japan, the Takarazuka City Council in Osaka passed a resolution on 28 March calling on the Government of Japan to address the issue of the “comfort women” system. On 25 June, the Kiyose City Council in Tokyo followed suit. On 7 November, Sapporo City Council, Hokkaido, passed a similar resolution. 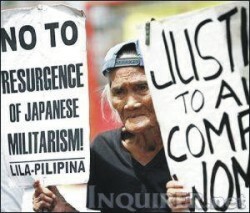 “These resolutions are a call for action from the Japanese government” said Sam Zarifi, Amnesty International's Asia-Pacific Director, “The Japanese government should recognize that the world will not forget the abuses inflicted by the 'comfort women' system. The Japanese government should apologize for its actions now and move forward”.